Once your book is printed, it’s time for distribution—the process of getting the book into the hands of readers. At BookPrinting.com, regardless of whether you use us for printing, we offer two distribution channels: direct-to-consumer (often called fulfillment) and expanded distribution (which is similar to traditional book distribution methods). Expanded distribution can be broken into two additional paths, where your book goes to brick-and-mortar stores or to online resellers. The first step of your book getting to readers is the same whether you have expanded distribution, direct-to-consumer fulfillment, or both. Your books have to be in our warehouse for us to distribute them, so they’ll have to be shipped to our warehouse—either directly from the printer or from another location. Since you’re able to use our distribution services on an a la carte basis, you’re not required to use our printing services. But, if you’ve printed your books elsewhere, you’ll need to ship books directly to our warehouse, and we’ll provide instruction on how to do so. If you print with us, you’ll be able to denote a specific quantity to be shipped to our warehouse as part of your print order, and we’ll send books there when they’re finished printing. Please note that the printer and our warehouse are in separate locations, so you’ll still be responsible for paying the shipping costs. Once your book is at our warehouse, what happens next depends on which type of distribution you’ve chosen. 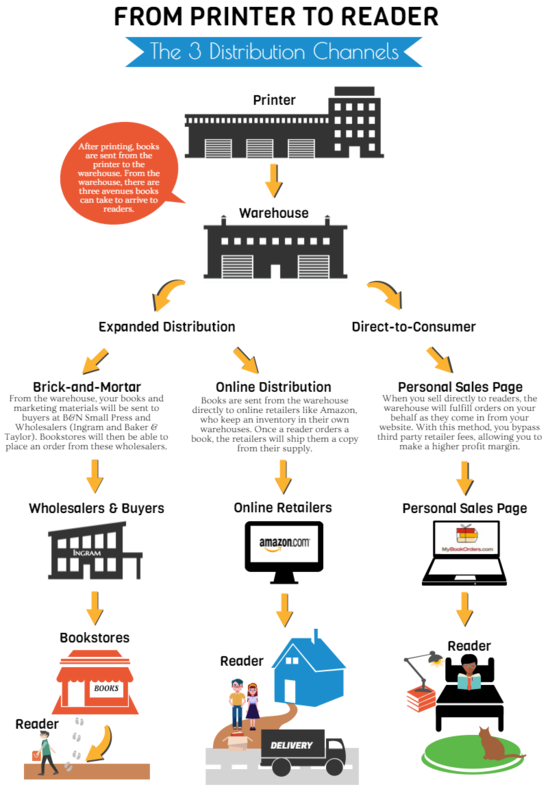 Expanded distribution mirrors the traditional model of book distribution, where your book is stored at a warehouse, then shipped out when an online retailer or wholesaler orders copies. These wholesalers and online retailers display your distribution listing (example here), which we’ll release once your inventory arrives at our warehouse. This distribution listing allows consumers to find and purchase your book. To begin expanded distribution with BookPrinting.com, you’ll need to have at least 75 books in our warehouse. Once in the warehouse, your book will travel along slightly different paths to reach consumers, depending on where sales take place. Online retailers sell directly to readers, while wholesalers typically supply brick-and-mortar bookstores. When your book is sold through online retailers, like Amazon.com or BN.com, these companies order your book from our warehouse to ship to theirs, then ship your book on to the customer. This shipping timeline is important to keep in mind when you set a publication date. You’ll also want to factor in the time necessary for books to travel from the printer to our warehouse, along with the time necessary to check in your inventory (approximately 7 business days) and the time needed for your distribution listings to go live (an additional 7 business days). In addition to having your book sold online, expanded distribution allows you the possibility of getting your book into brick-and-mortar bookstores by listing your book through wholesalers, such as Ingram and Baker & Taylor. Any independent bookstore can order your book through these wholesalers. If your goal is to get your book on physical bookshelves, expanded distribution is your best option. You’ll also be included in a returns program, which allows your book to be returned if it doesn’t sell, making it more attractive to book buyers. To determine your net profit, don’t forget to subtract the original print cost from your royalties. *There is an additional variable shipping fee per book, to cover the cost of shipping from our warehouse to a third-party warehouse. This fee ranges from $0.40 to $1.50 per book, on average. Your sales reports will be compiled in your Author Center Account, which you’ll be working in throughout the process. The Author Center will also monitor your inventory levels and let you know when it’s time to send more books to our warehouse. When your royalties reach $25, the payments will be distributed to you monthly, provided you reach the $25 threshold. If, in any given month, you don’t reach $25, your funds will be rolled over to the next month. The other distribution service we offer is direct-to-consumer fulfillment, which allows you to sell your book directly to consumers through a personal sales page. By selling directly to consumers, you can maximize your royalties by cutting out part of the distribution chain in the expanded model. Both distribution options aren’t exclusive, meaning you can use expanded distribution and fulfillment to broaden your reach and increase your profits. With BookPrinting.com’s direct-to-consumer fulfillment service, we’ll supply you with a sales page that functions like an online bookstore. There you’ll be able to create promo codes to discount your book. We’ll also supply you with the tools necessary to put a “Buy the Book from the Author” button on your website. When people click that button, they’ll be taken to a personal sales page where they can order your book and have it shipped directly from our warehouse. When our warehouse staff receives the order, they’ll ship out the book within two to three business days. To get started with direct-to-consumer fulfillment, you only need to send 25 books to our warehouse. To determine your net profit for direct-to-consumer fulfillment, don’t forget to subtract the original print cost from your royalties. As with expanded distribution, we’ll compile your sales reports and inventory levels in your Author Account. Your royalties will also be paid out monthly, provided you reach the $25 threshold. If you have any questions about distribution, please feel free to reach out.